James A. Owen is the illustrator and writer of the Starchild comic books and the Mythworld series. He's also the founder and executive director of Coppervale International, an art and design studio. In both 1994 and 1995, James A. Owen was listed by Hero Illustrated as one of the top 100 most influential people in the Comic Book Industry. He has also written and illustrated the Chronicles of the Imaginarium Geographica, which includes Here There Be Dragons. Matthew Peterson: Hello there. I’m Matthew Peterson, author of Paraworld Zero and radio show host of The Author Hour: You’re Guide to Fantastic Fiction, which can be found at www.TheAuthorHour.com. Last week on my show I had Sherrilyn Kenyon, Patricia Briggs, Kelley Armstrong, and Charles de Lint. Today I’ve got four young adult authors: James A. Owen, Frank Beddor, John Flanagan, and James Dashner. My first guest is James A. Owen, illustrator and writer of the Starchild comic books and Mythworld series. James is the founder and executive director of Coppervale International, an art and design studio. In both 1994 and ‘95, James was listed by Hero Illustrated as one of the top 100 most influential people in the Comic Book Industry. James has also written and illustrated the Chronicles of the Imaginarium Geographica, which includes Here There Be Dragons. Thanks for being on the show, James. James A. Owen: Oh, thanks for having me, Matthew. Matthew Peterson: Now, I met you not too long ago where you, me, and Aprilynn Pike were doing a book signing together. James A. Owen: Yeah, at the convention in Tempe. Matthew Peterson: Yeah, the FiestaCon, I think. You had a very unique way of signing books that put Aprilynn and me to shame. [laughs] You actually drew a picture of a dragon on the cover page with your signature. James A. Owen: You know I keep saying that I’m going to stop doing that, but it goes over so well with the readers that I always end up breaking down and pulling out the pens and going to town on it. You know, it’s kind of a unique position to be in, where I’m also the illustrator of the books that I write. That really doesn’t happen too often. James A. Owen: And my background in comic books, we used to do the trade shows, myself and several other creators, and I learned from them how to do these sketches for these retailers. So I got in the practice. I mean, at one trade show I think we all did twelve-fifteen hundred sketches in four days. Matthew Peterson: Oh. Oh man! James A. Owen: So you had to learn how to draw in ink really fast while you’re having a conversation with people. And one of the first trade shows I did for Here There Be Dragons, one of the first people in line for the advance reader copies was a comic book retailer. And he said, “Are you going to do a sketch in the book, like you did in the graphic novels?” And I thought that sounded like a fine idea, so I did a few sort of lousy dragons and then that night sat in my hotel room and figured out a way to do a nice looking dragon with minimum number of lines and ever since I’ve contributed a lot to the pen manufacturers’ bottom lines. Matthew Peterson: Oh, I can imagine. James A. Owen: Buying lots of blue and red and green and . . . [laughs] pens I needed to draw the sketches. Matthew Peterson: Well, I have a hard enough time signing my own name while talking to someone. So I just can’t imagine doing a whole sketch. That’s definitely a talent that you have. Matthew Peterson: Oh, yeah. Yeah. James A. Owen: It’s a cumulative thing and you know, I must have drawn eight or ten thousand of those dragons by now, so I’ve kind of got it down. Matthew Peterson: You’ve got it down. Yeah. Well, the other day I saw a video of you online. This was kind of a funny video. It was a “Save the Book Babe” event with Stephenie Meyer . . .
James A. Owen: That was quite an event. Which video was it? James A. Owen: Okay. Now, having that range of authors as my backup dancers, you know, that’s now the top item on my resume. James A. Owen: It was Project Book Babe for our friend Faith Hochhalter, who was instrumental in helping launch the careers of me and Shannon Hale and Stephenie Meyer and P.J. Haarsma, just a dozen authors that came together to help her out when she was diagnosed with breast cancer. And Shannon Hale got this idea of us dancing to this Aretha Franklin song on stage and then for whatever reason, and I blamed it on the cold medication I was taking, I thought it would be less embarrassing to actually sing the Aretha Franklin song so I wouldn’t have to dance with the rest of the authors. Matthew Peterson: [laughs] Oh man. James A. Owen: The funny part is we never got to rehearse. And the version that we learned the song to is a slightly different version than the one they learned to dance to. And when we started, we couldn’t hear the music. The auditorium could, but we couldn’t. James A. Owen: So I started late. The music was already going, so the choreography didn’t match up with the lyrics I was singing. And then at the end when they were supposed to start freestyling, Brandon Mull started freestyle dancing when the rest of them were trying to do the choreographed stuff. Matthew Peterson: Yeah, that’s what I saw. James A. Owen: And then Dean Lorey and Stephenie Meyer came out behind us and started vogue-ing their way across the stage, and the whole audience screamed, which meant we couldn’t hear the music at all, so pretty much it was an absolute travesty as far as music and dancing ability went. But as far as an event for our friend, Faith, I think it was a smash. Matthew Peterson: Yeah. Oh, definitely. I think a lot of money was given. And I feel like such a dummy. I got an email about it. I was going to go and I don’t remember, something came up. I mean I actually live not too far from where it was, so I feel like a dummy, I didn’t go. But I did see it on YouTube. Matthew Peterson: Yeah. Enough authors have a hard time just getting out, signing books, I mean, let alone singing and dancing. That’s all good fun, and it was for a good cause. Matthew Peterson: I have to say, even before I met you, I remember seeing the covers just like online and I was like, “Man, that cover is everywhere. I see that.” It’s very recognizable. Matthew Peterson: I think you might have brought a book with a different . . .
James A. Owen: Oh, I think that’s what it was. Matthew Peterson: Yeah, I didn’t realize it was Here There Be Dragons. Matthew Peterson: Well, tell us a little bit about Here There Be Dragons. James A. Owen: Here There Be Dragons is about three young men, John, Jack and Charles, who meet in London in 1917 when John’s mentor is murdered. And when they come together and are discussing this terrible event, they also meet a strange little man named Bert, who gives them a book; it’s an atlas of maps called The Imaginarium Geographica, and it has maps of every land you’ve ever read about. Every myth, legend, fable and fairy tale, they all have places that are listed in this atlas, and there are maps that show you how to get there. And he tells them that John’s mentor, a professor of ancient literature, had been murdered because he was the caretaker of this book. And now it’s their responsibility and they need to leave London because the people who killed John’s mentor will be looking for them. Matthew Peterson: Looking for them. How old are the main characters? James A. Owen: Range from age 17 to age 30. Matthew Peterson: 17 to 30, okay. James A. Owen: So Jack’s the youngest at 17, John’s in his early 20’s and just returned on a break from the war, and Charles is 30. James A. Owen: And they age progressively in the series. We jump forward several years at a time with each successive book. So the point we’re at now with book four, The Shadow Dragons, they’re all well into middle age, which is also a bit of a unique thing for a young adult book. Matthew Peterson: Yeah. ‘Cause I know it was a young adult book and I heard someone mention that it does help if you’re well-read. You know, because you’re talking about lots of different things in this atlas, different writings. James A. Owen: Well, I combine lots of literature, folklore, history, mythology, it’s all pretty interwoven. But I’d written them to appeal to as broad a reading range as possible. A good example is from Here There Be Dragons, chapter 4, there’s a character called the Green Knight. If you’re reading at say a grade school level, you see this character named the Green Knight who’s made of wood and that’s pretty cool. If you’re reading a little higher level, say middle grades and up, you realize that he’s the guardian of the island of Avalon, so there’s a King Arthur connection. James A. Owen: That’s pretty cool. If you’re high school level and above, you get to read between the lines and you realize that his real name was Charles Darne from Charles Dickens’ Tale of Two Cities. And becoming the Green Knight was his penance for what happened to Sidney Carten, but you don’t have to catch any of that to enjoy the fact that there’s this cool knight made of wood that moves the story along. James A. Owen: I’m getting a lot of mail from people that are reading them, you know, two and three times and are catching some of these details they didn’t catch the first time around. And that’s very rewarding as an author to know that a lot of the work you put into that is actually paying off. Matthew Peterson: Yeah. And the latest book in the series, The Shadow Dragons, what’s that book about? James A. Owen: That one, we’ve jumped forward considerably. The first book was 1917. The Shadow Dragons takes place in 1943, so we’re in the heart of World War II. And basically it’s a confrontation between the caretakers of the Geographica: John, Jack and Charles and one of their great adversaries. And the fun thing about The Shadow Dragons is for the first time we meet the caretakers emeritus, because inside the cover of The Imaginarium Geographica is a listing of all the caretakers who have come before, and it’s all famous men and women from history: scientists and scholars and authors and artists. And there’s a place where they can all actually come together at once. And I get to actually do that in The Shadow Dragons, and that’s probably the most fun of that entire book. Matthew Peterson: Yeah, I can imagine. So not only do you do the covers, which are very unique, very interesting covers. Almost every one of them, I think that I’ve seen, have a dragon on it, but you also do illustrations within the book as well, right? James A. Owen: Every chapter has a full page illustration with it. That’s kind of a nod to my background with comics that I love to have the illustrations along with the prose. James A. Owen: [laughs] Well, you know, I’ve gotten into this rhythm. Every book in the series is exactly 24 chapters. James A. Owen: We have six sections of four chapters each. So I know there are going to be 24 drawings in each book and it was kind of daunting when we turned around and looked at it and realized that in the first four books I’ve done over a hundred drawings. And they’re not exactly the kind that you just phone in. Well, I’ve been speaking with James A. Owen, the author of the Starchild comic books and of Here There Be Dragons. Thanks for being on the show today, James. 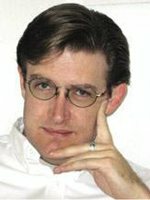 James A. Owen: Thank you, Matthew. Matthew Peterson: Alright, go to www.TheAuthorHour.com to listen to the bonus questions. Stick around. I’ve still got Frank Beddor, John Flanagan, and James Dashner.